It’s not just the summer months though when this can happen. Instead, it’s better to keep kids focused on their faith throughout the year, on a weekly and daily basis. So engage in these five family activities routinely. They will help you grow spiritually and allow you to spend time together with the family. I’d argue they should be foundational activities for any family of faith. In order to ensure that your family’s faith is as strong as can be, communicating with God needs to be emphasized. So take time to pray together as a family, at least once a day. This will help prayer become a habit. Plus, as you continue to pray, you will see answers. And that will be a big encouragement. Additionally, you don’t want your children to have the example praying to God only when they are in need of something or things have gone wrong. Praying should be a prominent aspect of their lives, so make it a family affair. Maybe you could find a prayer for each day and pray when you are together. Of course, praying before every meal is a great way to thank God for the blessing of the food you’re eating. You can also pray with your children individually every night before bed. This allows them to reflect on what they’re thankful for or remember people in their lives that are struggling and need help. Going to church is an important part of your faith. It’s where you learn more about your spiritual life and get encouraged and challenged on your relationship with God. Therefore, it’s vital to make it a priority for the entire family. Going to a weekly church service is a great way to keep your family concentrated on the role that God plays in your life. If you’d like, you can make a point to go to church more than just once a week. Even if you can’t attend the service for some reason, you can have church in your home. There are many churches that offer their services on demand. You can find one that posts their services online and watch at home with your family when it’s convenient for you. Another major component of faith-based family time is guaranteeing that the content in your household is wholesome as well. We want the best for our children and what they’re watching on TV or online. With media where it is today, parents must filter what comes into the home. In our household, this has been a huge priority, especially when the children were young. Watching Christian movies as a family is a great way to not only bond with your kids. But it also allows you to make certain that the movies and shows you watch align with your beliefs. You can watch family-friendly movies, documentaries, educational shows or cartoons and the whole family will love it. 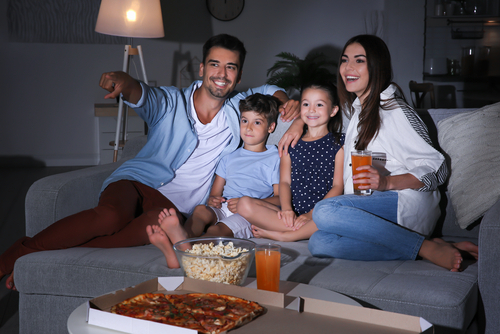 Having a recurring movie night that your family can look forward to means your kids will count on the time you can spend together. When devoted to making faith a priority, it’s essential to surround your family with other faith-focused families. This doesn’t mean every person you come in contact with or have a relationship will share all your values. That’s impossible. But for the people you want to develop the closest friendships with, it’s best for your spiritual growth and development if their values align with yours. So, spend time with families you have met through your church. Or if your kids have made friends at Sunday school, invite their whole family over. With the warmer weather, you can go on a group outing or just gather at the home for a cookout. Your children will develop long-lasting friendships with children who share the same values as them and you and your spouse will make friends as well. The Bible will help you grow spiritually and will be a guide for you through life’s circumstances. So, for the family of faith, Bible studies can be a great way to bond. Now most people do a Bible study alone, on their own time. However, a group Bible study can be very beneficial.We are currently in a small group Bible study and it’s been a great blessing. You can do something similar at home by picking a night every week for your family to get together. There are plenty of Bible verses to help overcome life’s struggles that can be beneficial to your entire family depending on what everyone has going on in their day-to-day lives. At your weekly Bible study, have every member of your family share what they are learning in their Bible study from that week. These five activities are essential for any person who wants to grow spiritually. When applied to the family, they can also serve as ways to spend time together. Make each of these a regular practice in your home. Questions for Discussion: Which one of these activities has proved most beneficial for you? Does your family do any of these activities? What other family activities have proved valuable for you?